So, finally I'm able to post about this rediculous toy that has taken me over a month and a half to complete! It seemed at every turn I was running into an issue with the various found objects I was using - or I just kept on having more and more new ideas, and couldn't make up my mind how to move forward! Anyway, here it is - My RAMPAGE Dunny-Monaut (think 'Cosmonaut' but for Dunny) Custom!!! The body on this guy is a Mini-Munny, and the head (inside the helmet) is a Dunny. Here I used the left-over parts from last December when I made 'Kawaii' (check out the January post "Kawaii!" to see where the other parts got to). The hinged helmet opening was tricky, and took numerous attempts to get right... I eventually came accross a small make-up compact that wass the right size, and only took a hour or so of dremel work to perfect. All of the sculpting was done with Kneadatite 'Green Stuff,' combined with found objects, some plastic card and some masking tape here and there. The paint is primarily sprayed on (gray then blue then white), leaving some areas less covered and some more 'splattered' looking. The rest is acrylics. The Dunny head was painted and floced (yay! fuzzy bunny!). Anyway, enjoy! I'm psyched on the results and welcome any and all comments! Here's the full-frontal view - helmet closed to keep the out of the vaccum of space!!!!! ...And here's te open-helmet-view. The hinge moves smooth like butta'. Dunny-Monaut has three kills - so far... I used waterslide decals for these skulls and some of the other tiny details. The gun was modified from the full sized Munny accessory, then masked, sprayed and detailed with acrylics. Here's Dunny-Monaut himself - Handlebar Moustache and all! Watch out! Check out the RAMPAGE TOYS Flickr page for more photos - including documentation of this fella in the making. I'm also working on about 5 other custom toys at the moment - including one for the upcoming PVC Show (hosted by Delicious Drips and Skully Boom). Stay tuned for more toys and art from RAMPAGE TOYS!!! Famous People + RAMPAGE = AWESOME!!! Hello Again out there in Internet Land! Well, as the title of this post suggests, RAMPAGE TOYS has been on the go and 'working' in the presence of some massive celebrities! Yeah! So, yeah, they might not be known to all people in all lands the world over, but these people are known to me and MANY MANY others within the two most righteous circles of coolness: Toys and Sci-Fi! What more DOES one need!?!?!? 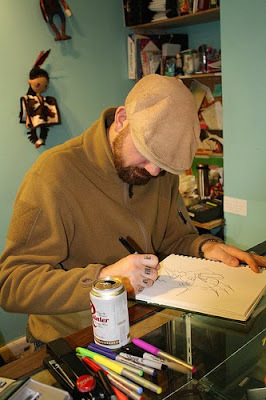 Huck himself - doin' a doodle in the RAMPAGE TOYS sketch book. A trusty can of Ranier (pronounced: "Ron-yay" of course) nearby. Trexi from the front. Some smooth paint and Huck's signature doodle on the belly. Very Nice! Paint splatters. Precise AND random! umm.. that makes sense, right? 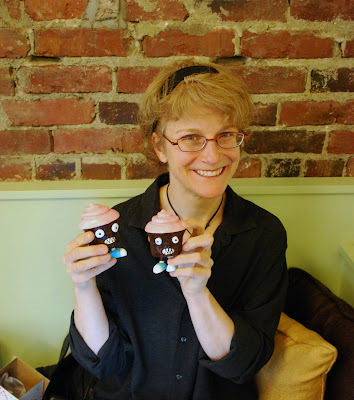 Kij and her cupcakes! YAY! Coffe and Cupcakes? But wait, the cupcakes are taking bites out of YOU! As, always, there's a ton in the works - including some 2d Artwork, and more toys. Check back in the next couple of weeks for more from RAMPAGE TOYS! In the meantime, feel free to check out the flickr page for photo updates. Finally, here for your reading pleasure: The storied pasts of Jelly-O and Punkin Pie! 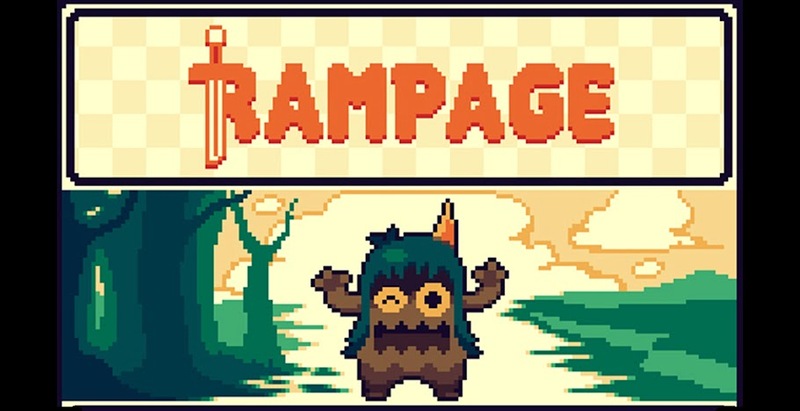 Jelly-O: Jelly-O is the most savage of all the RAMPAGE characters! His sharp teeth and 132.77 psi jaw clamping capacity make him a toe biting terror, so you'd better watch out! Jelly-O wants nothing more than to play the ukulele, and therefore lives a life of frustration - he has no arms!!! He takes out his angst on unsuspecting children, who run away in fear once they realize that the Jello-snack they though they just found was in fact a ravenous monster with sharp pointy teeth and NO MERCY! BE AFRAID! More soon on the RAMPAGE BLOG! MUCH MORE!! !